Add the iAVS16 to your account to receive email notifications about software/firmware updates and more. Having Problems? Find answers to specific support topics. Why does Alexa's weather report differ from the weather icon on the iAVS16 display? The iAVS16 displays weather based on the zip code you provided during setup. The same zip code needs to be provided to Amazon via the Alexa app. Open the Alexa app and tap the Menu icon (three horizontal lines at the top left of the screen). Select " The name of your device"
Select "Time Zone", Select your time zone, Tap "Change" select the region and Tap "Done"
Why can’t I control my iHome SmartPlugs with the iAVS16’s Sleep or Smart Buttons? You must use the iHome account that is associated with the SmartPlugs. Using an alternate account will not allow you to synch your SmartPlugs to the iAVS16. 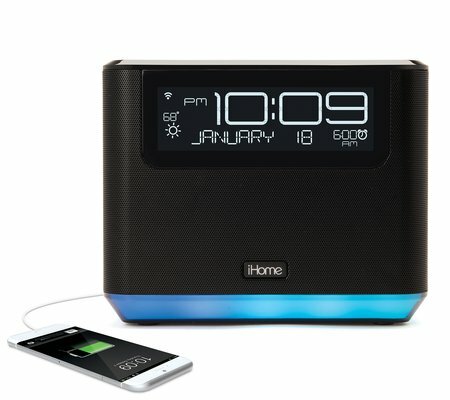 Reset the speaker and login with the same iHome account as your iHome SmartPlugs. Note: To reset the unit, press and hold the “Alexa” button for about 15 seconds. A voice message will let you know when the unit is being reset. Warning: All other settings will be cleared as well. How can I share my Alexa Speaker? Other users can view the Alexa Speaker when on the same Wi-Fi Network. While they can use their own iHome account to access the Alexa Speaker, we recommend using the same iHome account to ensure full functionality of the Alexa Speaker and the “iHome AVS” app. Why doesn’t my Alexa Speaker connect to my Wi-Fi? Make sure the speaker is connected to the AC adapter, and the adapter is plugged into a live outlet. Make sure that you are connecting to a personal network (2.4Ghz, 802.11 b/g/n) and not an enterprise network such as in a business setting or college dorm. Make sure your device is on the same network. If the issue persists, restore the Alexa Speaker to the factory settings. Press and hold the “Alexa” button for about 15 seconds (a voice message will let you know when the unit is being reset) and try again. Why can’t I see my Alexa Speaker in the “iHome AVS” app? Make sure your device running the iHome AVS app is on the same Wi-Fi network as the Alexa Speaker. Discover answers to some of the most common questions about your iHome product. My iAVS16 did not change the time during Daylight Savings. Open the “AVS app” and select the “Settings icon” located at the bottom right of the screen. The update will take about 30 minutes, but can vary depending on your network speed. Select a time zone DIFFERENT than yours. Your iAVS16 should now show the correct time. How can I set a favorite radio station, artist or song to play through iHeartRadio via a Smart Button? Log into your iHeartRadio account. Tap the iHeartRadio icon on the “Now Playing” screen. Search and select a radio station, artist, or song. Tap the “Heart icon” at the top right of the screen. The heart icon will change to a solid color indicating it has been added to your favorites. You may now select the desired “favorite” in the “iHome AVS” app when programming iHeartRadio to a Smart Button. How do I access Spotify or the Spotify Connect feature? Sign up for a Spotify Premium account. Login to your Spotify account. Go to the Spotify Home page. Select the name of your iAVS16 device. Why can’t I use Spotify through Alexa? You can stream Spotify through your iAVS16 via Bluetooth or Wi-Fi; however Alexa voice commands will not trigger Spotify playback. Spotify is not currently integrated with Alexa through 3rd party devices. Why doesn’t the speaker display reflect the volume level that I communicated to Alexa? The Alexa Speaker has 40 volume steps. Alexa recognizes 10 volume steps. We have mapped those 10 steps to our 40 scale. In other words, when telling Alexa to play at “Volume 5” it will display as “Volume 20,”etc. (scale of 4:1). Why doesn’t my Bluetooth connection resume after using Alexa Voice Command? The Bluetooth function is an independent module on this Alexa device. Alexa voice control is not integrated with this function. To resume your Bluetooth connectivity after interruption, simply tap on the Bluetooth button on the top of the unit. Why can’t I trigger Bluetooth connectivity via Alexa Voice Command? The Bluetooth function is an independent module on the iAVS16. Alexa Voice Command is not integrated with this function. Do I need an Amazon Prime Subscription for Alexa Voice Command to work? No. You do not need to upgrade your Amazon account to Prime status for Alexa functionality. However, some features (like Amazon music) are associated with Prime status. How to integrate your SmartPlugs with Alexa? Select “Plugs” to view a list of all your iHome SmartPlug devices. You should now be able to control your SmartPlug(s) by telling Alexa to turn your device name ON or OFF. Will I lose my settings if I reset the iAVS? Yes. All settings are stored locally on the Alexa device. A reset will restore your unit to factory settings. How do I reset my iAVS? Press and hold the “Alexa” button for about 15 seconds. A voice message will alert you when the unit is being reset. How do I check for firmware updates? Open the “iHome AVS” app. Select the name of the iAVS at the bottom of the screen. How do I turn-off the Sleep function? Press and hold the Sleep Button to end Sleep mode. What does the Sleep button do? Similar to Smart Buttons, Sleep is a programmable button that can be set to control a group of actions with a single press. The unique feature of Sleep Action is that local changes (i.e. volume, lighting and brightness) are associated with a timer that will automatically turn off the light and audio as you drift to sleep. You can set Sleep mode using the “iHome AVS” app under the speaker detail view. What is the Bluetooth wireless range for audio streaming? The Bluetooth wireless range is approximately 33 feet. Does my phone have to be connected to the iAVS for the “Smart Buttons” to work? This unit is a Wi-Fi enabled device and can function without a phone connection. Once the “Smart Buttons” have been assigned a task, they will operate independently. How do I set up the Smart Buttons? To program the “Smart Buttons,” select the your model in the “iHome AVS” app. Select the “Smart Buttons” icon and follow the on-screen instructions. Why does the iAVS16 light-up prior to sounding the alarm? If the iAVS16 has “Pre-wake” enabled, all alarms will start a lighting mode 10 minutes before the alarm time to gently wake you. It can be enabled/disabled via the “iHome AVS” app in the alarm section. Alarm Pre-wake is a feature that initiates a lighting mode 10 minutes before the alarm time to help gently wake you with increasing brightness. It can be enabled/disabled via the “iHome AVS” app in the alarm section. Can I change my alarm settings if I lost Wi-Fi connectivity? No. The alarm settings can only be changed within an active Wi-Fi network. Will the iAVS alarm sound if I lose Wi-Fi connectivity? Yes, the iAVS alarm settings are stored locally. The alarm will sound if you lose Wi-Fi connectivity. Will the iAVS alarm sound if I lose power? No. the iAVS does not have a back-up battery. Why can I only see one alarm time on the iAVS display? The iAVS will display the upcoming alarm time. If you set an additional alarm that occurs AFTER the first alarm, it will appear on the screen AFTER the original one is triggered. You can press the Play/Pause button on top of the unit to stop the Alarm. You can ask Alexa to stop the Alarm (example: “Alexa, end my alarm”). Alarms are handled by Alexa and can be set by using your voice or the Alexa app. An example might be “Alexa, set an alarm for 7:00am.” Alarm experiences can be customized using the iHome AVS app. How do I adjust the display brightness? Press and release the “ZZZ/display dimmer” bar to cycle through and select the desired display brightness level. Can I connect to a 5.0 GHz network? The iAVS is only compatible with 2.4GHz networks. If you have a dual band router (2.4GHz and 5.0 GHz), please connect to the 2.4GHz network.